A drive down any Catskill back road right now reveals apple trees heavily burdened by ripening fruit. By most accounts, this fall’s harvest will be a banner one. But don’t harp about that to Wayside Cider partners Irene Hussey and Alex Wilson, who are holding their breath with farmers’ superstition. Barring unforeseen crop disasters, the fledgling farm cidery in Delhi is poised for enormous growth in its second year, with plans to produce at least twice and maybe as much as three times more hard cider than last year. Its 2014 harvest yielded 4,500 bottles, which have almost disappeared from the market. Restaurants and retail locations, which each make up about half of Wayside’s business, already are lining up for inventory from the cidery’s sophomore year output, expected to fall between 10,000 and 15,000 bottles. 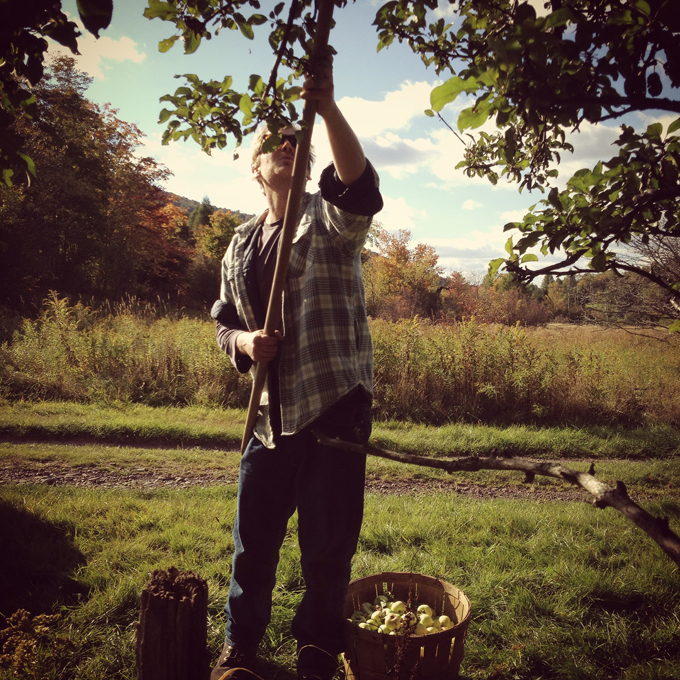 The two-person team of proprietors does all of the picking, pressing and processing of a combination of wild and heirloom Catskill apples, along with all the marketing and distribution. Hussey is the chief cider-maker while Wilson is the primary front-man, but they both wear all the hats in the business. The pair met through mutual acquaintances, and then joined forces to found Wayside last year after competing in an amateur cider-making competition hosted by Table on Ten in Bloomville. Wayside’s portfolio features two mainstay products and a changing roster of special creations. The flagship, which is called Catskill and was named one of Bloomberg’s five “Must-Try Modern American Ciders” in May, is aged in bourbon-soaked oak barrels handed down from Delaware Phoenix Distillery in nearby Walton. The other is called Half-Wild, a combination of wild local apples and cultivated dessert varieties like Gala and Jonagold, sourced from commercial Hudson Valley orchards. A third variety, the Skinny Dip, was produced from a single pressing of dessert varieties and given a little bite with the addition of locally harvested quince. Wilson and Hussey also handle all the customer deliveries, driving cases in the back of a Subaru from their headquarters at High Meadows Farm just outside Delhi to stores and restaurants throughout the Catskills and all the way down to Manhattan and Brooklyn. Their products are served or sold by the bottle in seven city locations, including Wassail, an all-cider bar and restaurant on the Lower East Side. Also this summer, Wayside opened a combination store, farmers’ market and tasting room at 11 Delaware Ave. in Andes, a joint effort with Sean Scherer, the proprietor of curiosity shop Kabinett & Kammer. Called The Annex, it is open Saturdays only, from 11 a.m. to 5 p.m., and sells antiquities and oddities from K & K, along with locally made cheese, locally grown flowers and produce and other small-batch Catskills goodies. Coming up, Wayside will be offering samples at two events in Bovina: the Open Barn and Studio Tour on Aug. 22, and Bovina Farm Day on Sept. 6. 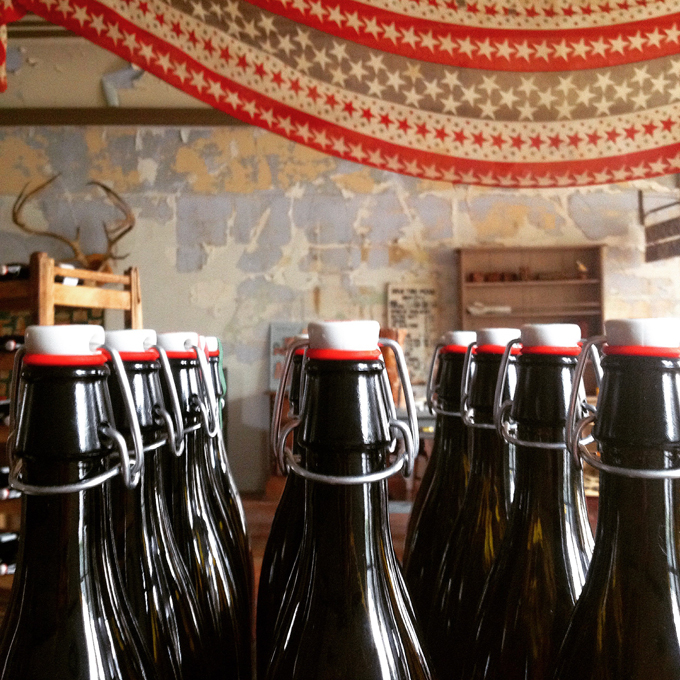 Dinners featuring cider pairings are planned at the Annex and in the city this fall. Collaborations with other local craft-beverage producers are also in the works, including an apple brandy, a project with Delaware Phoenix. Hussey and Wilson also planted 100 apple trees this spring, with an eye toward eventually having 30 acres of orchards to harvest. They are not alone in their ambition; cideries are one of the fastest-growing segments of New York State’s booming craft beverage market, thanks largely to the farm cidery law passed in 2013, which offered incentives for small cider-makers using New York State grown produce. As of October 2014, the one-year anniversary of the legislation, there were 29 cideries statewide, up from eight the previous year. Delaware County is home to one other in addition to Wayside, Awestruck Ciders in Walton. Wayside’s owners see their business as a chance to contribute to, and participate in, a larger community built around Catskill-made food and drinks.